This is further to my previous post in conjunction with my fellow bloggers, led by Jorg Colberg and Colin Pantall, encouraging our network to nominate "photographers who have demonstrated an openness to use new ideas in photography, who have taken chances with their photography and have shown an unwillingness to play it safe." I've known Rob Hann for many years since he was syndicating his photographs of musicians through my agency in England. We've seen different incarnations of each other in that time, and Rob's latest and I think most brilliant is what you see above. His love of the great American road trip and his humourous eye enable him to create an ongoing, thoroughly enjoyable series of photographs. 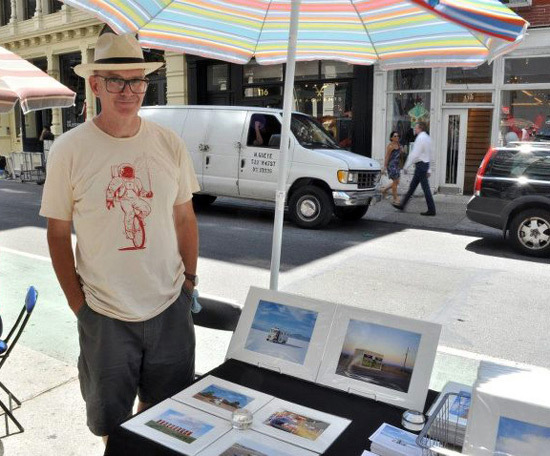 In the last couple of years, the charming Rob can be found on Prince Street in Soho, New York, selling matted prints of his most appealing images in two sizes well under $50. Not only is he selling multiple copies himself at affordable prices, Christiane Celle of Clic Gallery discovered him on Prince and he is now represented by them for fine art prints. Rob is getting to meet all sorts of people, including editors and art directors, and has even picked up a commissioned job. Putting himself literally out there and pimping a product must have been a daunting prospect, but Rob has turned it into a profitable enterprise of which he should be proud. I commend him for not being complacent, not crowd-funding his career, and never, ever moaning about standing on the street all day. View Rob's first aCurator feature Deserted States of America. View Rob's second aCurator feature Tucson to Tucumcari. View Rob's third aCurator feature Lone Star State of Mind.